Tom Libby, Kaushik Jayaram and Pauline Jennings. Courtesy of Poly-PEDAL Lab UC Berkeley. Have you ever stomped on a cockroach, only to lift your foot and see the bug skitter away? That alarming un-stomp-ability may actually someday save lives. Researchers have created flexible, cockroach-inspired rescue robots that can squeeze through cracks. They describe their invention in an upcoming paper in the Proceedings of the National Academy of Sciences. Cockroaches may be unpopular with most of us, but they’re all the rage inside the University of California-Berkeley’s Poly-PEDAL lab, where biologists and engineers uncover the secrets of animal movement. Researchers there see robotic possibilities in a gecko’s sticky footpads, a crab’s jointed legs, and the amazingly resilient body of the cockroach. Robert Full, head of the Poly-PEDAL lab, has been watching cockroaches for more than 25 years. We can thank Full for the disturbing discovery that cockroaches can run on two legs, and that they can reach speeds of almost five feet per second. All together, now: Thanks, Dr. Full. "Insects are the most successful animals on Earth,” Full said in a press release. “Because they intrude nearly everywhere, we should look to them for inspiration as to how to make a robot that can do the same." With that encouragement, Full’s student Kaushik Jayaram designed an experiment to figure out how cockroaches manage to continue moving, even while they’re being squashed. Jayaram sent cockroaches running through a short, transparent tunnel while taping them with a high-speed camera. He found that the bugs could squeeze through the tunnel even when it was smaller than the smallest part of the cockroach. “They're about half an inch tall when they run freely,” Jayaram said in the press release, “but can squish their bodies to one-tenth of an inch—the height of two stacked pennies." The cockroaches could also withstand up to 900 times their own body weight without being hurt. Even when the bugs were so compressed they could not move their legs, they somehow kept moving. Slowing down the high-speed film revealed that when their feet are unavailable, cockroaches scoot forward using the spines on their legs. We might be grossed out by this information, but like his mentor, Jayaram was inspired. "They have to use different body parts to move in these spaces, because their legs and feet are not oriented to work properly," Jayaram continued in the press statement. "But they are still capable of generating the large forces necessary for locomotion, which blew my mind." 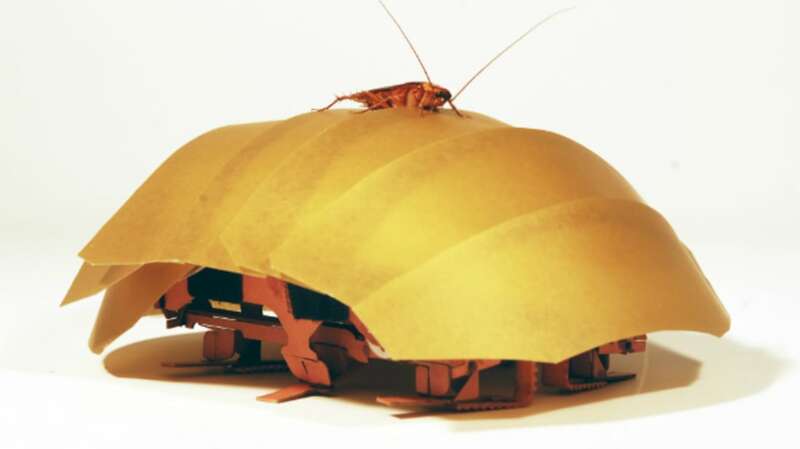 The result of this mind-blowing was the compressible robot with articulated mechanisms, or CRAM, a small, bug-shaped bot capped with a flexible plastic shell. Jayaram and his study co-authors created a bot that could smush down to half its height in order to wriggle through small spaces. Here's a video from Berkeley featuring the researchers' tests with live cockroaches and CRAM showing off its abilities. If you're squeamish about roaches, start at 01:21 to see the bot in action. The CRAM is still in its prototype stage, but Jayaram, Full, and their colleagues already have big plans for its future. "In the event of an earthquake, first responders need to know if an area of rubble is stable and safe, but the challenge is, most robots can't get into rubble," Full explained in the press release. "But if there are lots of cracks and vents and conduits, you can imagine just throwing a swarm of these robots in to locate survivors and safe entry points for first responders." The next time you find cockroach competition for your late-night snack, you might want to switch your futile stomp for a little high-five. Because you just never know—that cockroach, or at least its bot cousins, might save your life some day.